Published on November 12, 2018 by Wade Shepard Follow me on Twitter here. I did a big project in South Korea last summer about the new city of Songdo. This place is, literally, a new city that was built from scratch on land that was reclaimed from the sea that is now entering its initial phases of attracting a population and building its culture. I like new cities. I like the idea of new dots on the map and places that are writing the first pages of their history. I’m a traveler – the prospect of a new place — literally, a new place — that nobody has really described yet is too enticing to ignore. It’s kind of an odd type of exploration that’s representative of the times we live in. Good thing for me that there are around 200 new cities being built around the world right now. 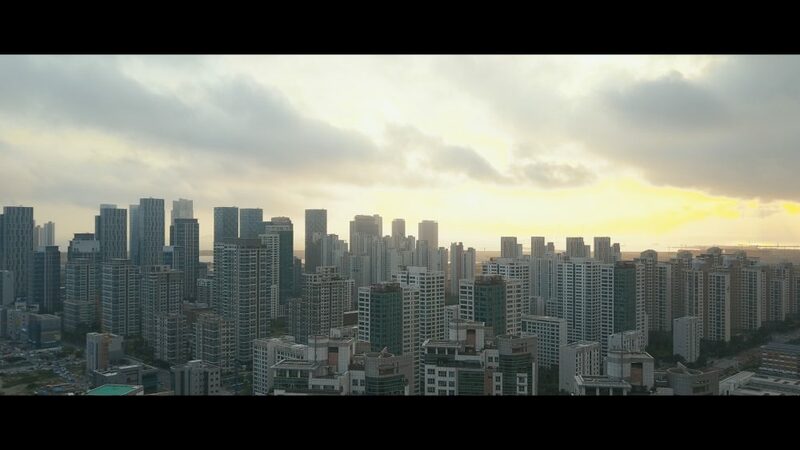 A still from the Songdo film. I went to Songdo to write some articles about the place for Forbes and some other publications that I was writing for. Business as usual. But I was hot off of a working on a documentary with BBC in Kazakhstan and realized that making these types of films was … it was exactly what I wanted to do. So I bought a couple new video cameras with the money I made from that project and went to Korea. I figured that if I was already going to be doing a project in Songdo anyway why not film it? My intention then was to do a little preliminary shooting, get some characters, find a few story lines and then pitch the new cities story to a major media network. I didn’t intend to publish what I was filming as a standalone documentary. 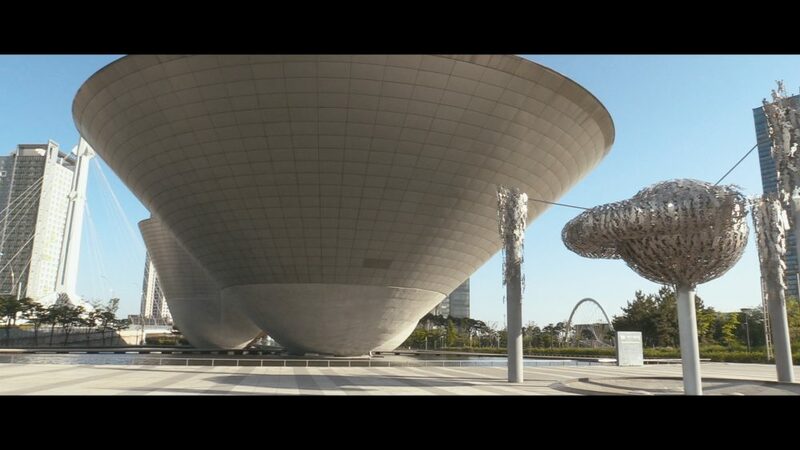 However, I filmed a little more that what I initially intended in Songdo. I ended up treating the project like it was a documentary project rather than a normal text journalism project, and it went very well. I was given access to whatever and whoever I wanted, and what I was able to collect was far beyond what I originally envisioned. Then I left Korea and wrote a few articles about Songdo … business as usual. The seeds of the new cities series that I was pitching didn’t fall on fertile soil — which wasn’t a surprise, the potential for success was pretty low from the start — and I was left with 500 gigs of footage that I wasn’t doing anything with. This autumn I was able to do just that. I spent the past couple of months editing the Songdo footage and put it together into a documentary that I recently published on YouTube and Vimeo. Now, this was a different kind of documentary project, as the emphasis wasn’t necessarily on the final product but on the process of creating it. I realized that I really needed a more complex film project to edit. Up until now I’ve either worked on documentary crews for news productions or have just been creating narrative vlogs and my own short documentaries — the full-length documentary is an entirely different story from an editing perspective. First of all, the amount of footage that you have is massive. Songdo had 500 gigs of HD footage. So organizing everything is an exercise in and of itself. Also being able to pick through all of that footage and find the story lines, the patterns, and put them together in a way that shares what you are trying to share is also completely different than when doing a short project. So this was basically a practice round for me. Ideally, what I put together would be called a rough cut. If this was a full-fledged film project I would watch it a few times, show it to a few people, and then completely dismantle this rough cut and reassemble it into a final version. First of all, there were some deficiencies in the technical aspects of the filming. I made some mistakes — especially when it comes to audio and lighting — that I’ve learned from. Some sections of this film are technically unusable for a professional delivery. Secondly, I lack a strong protagonist. My original plan was to use this young Afghanistan government urban development advisor — one of the top guys behind Kabul New City — as my protagonist and tell the story of Songdo through the discoveries that he was making there and kind of superimpose Songdo “The city of the future” over the story of the rebuilding of Afghanistan. It didn’t work out as well as I would have needed it to in the edit room. The Afghan guy was perfect — he loved the camera and performed well in front of it. I followed him all around, mixing formal interviews with a large amount of verite footage. In terms of on the ground shooting, I nailed it. But that story just didn’t come together. It was too complex an I needed too many elements that I just didn’t have to properly tell the story, so I postponed this story line. When doing a documentary project you really never know what you’re going to end up with, which is one of the reason why most documentaries are shot in phases. You go out and shoot a little, take it back to post, edit a little, find out what you need, and then go back out and shoot some more. It’s a normal process to discover new story lines in the editing process and to cut some others. You never really know what’s going to work until you starting putting the pieces together. That said, I still have that Songdo footage of the Afghan guy, and he’s currently in Rotterdam studying right now, so I may go and meet him and continue that part of the project. Another thing that stands out to me as being deficient about the Songdo film was that I did numerous interviews in Korean via an interpreter but I did not include these in the film. The reason for this was simple: I can use interpreted interviews for text articles easily, but for video the translation and the spoken words need to be matched up perfectly. I would have had to of hired a Korean translator and I simply did not want to create a budget for this. As I said, this was a practice round, and doing this would have thickened the story a little but wouldn’t have taught me much. That said, some of the interviews that I did in Korean were interesting. One was with the mayor of Incheon. Apparently, the mayor’s office found out what I was doing there and they wanted me to interview him. Why not? We had a nice talk, he told me some interesting things about what the place was like before Songdo was built — some stories of how he used to go there as a child — but I just didn’t have the budget to get it properly translated. I also interviewed via an interpreter the director of the IT command center, one of the ladies working there, and a restaurant owner from old Songdo who explained how the locals felt about having an entirely new city built right where they lived — cutting off their access to the sea, destroying the maritime ecosystem, and putting the entire local fishing industry out of work. In addition to this, Tony Fernandes, the founder and CEO of AirAsia also made an appearance in the shooting of this film that I didn’t include. While the subject matter of the interview did make it into a couple of articles on Forbes it didn’t really fit with this film. I realized that including it would have just been me saying, “Look at me including this famous dude in my film,” so I cut it. On the small chance that I ever decide to turn this into a professional project or if I go back to Songdo to continue the project I will get these interviews properly translated and include them. Other than that, the film is up. Please give it a watch and let me know if you have any advice or anything to say about it. ‘Documentary was awesome. Really cool to learn about these new places and specially how people are creating new opportunities and dealing with the new environment. Good examples are the agricultural crops in vacant building areas & creating a new music scene. Many thanks for this good content! Thank you, Andre, very much appreciated. Happy that you picked up on the gardeners. They’re pumping billions into “futuristic technologies” there but all anybody really wants to do is grow vegetables and play music. I found the place to be a good example of raw humanity rising up from the 21st century high-tech sludge.